This article is about the city. For the kingdom, see Wayrest (kingdom). 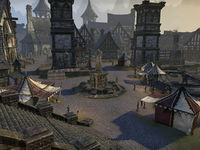 Wayrest has always been seen as a rival to Daggerfall, which was already well established when it first was founded as a sleepy fishing village at the mouth of the Bjoulsae River. Wayrest prospered greatly after the Fall of Orsinium in 1E 980 when the commerce of all of Tamriel began to pass through its gates. 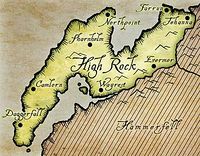 Today the city can boast the largest and richest population in High Rock. In 2E 542, the city was besieged by a horde of Reachmen, led by Durcorach the Black Drake, for fifty-seven days. After the Reachmen were defeated, Wayrest, along with Daggerfall, Shornhelm, Evermore and Camlorn, signed the first Daggerfall Covenant. During the Ranser's War in 2E 566 - 2E 567, Wayrest was besieged again, this time by the forces of King Ranser of Shornhelm. His army stood firm, but after the other kingdoms of the Covenant and the Redguard sailors from Hammerfell came to Wayrest's aid, Ranser and his troops were forced to retreat back to Shornhelm. After Ranser's defeat, the second Covenant was formed, with the city of Wayrest as its capital. In 4E 188, Wayrest was captured by corsairs, who also raided and destroyed the Dark Brotherhood Sanctuary located there. For game-specific information, see the Arena, Daggerfall, ESO, and Legends articles.